While many fax machines today are marketed as fast, reliable and efficient while still being affordable, only few are able to stay true to such marketing promises. The Brother IntelliFax-4100e, however, seems to go straight to the point in addressing the need for speed and reliability without posing as a "cheap" alternative to other fax machines. For business and office owners who prioritize speed and efficiency for their faxing needs over costs, the Brother IntelliFax-4100e looks to deliver on the product's tagline as a high-speed, business class laser fax machine. The IntelliFax-4100e boasts a high speed 33.6K bps SuperG3 modem to handle multiple faxes, with the ability to adapt in communicating with other machines. Its 3 seconds per page speed is remarkable, highly recommended for offices that does a lot of daily faxing. The IntelliFax-4100e also features an 8MB memory able to store up to 500 messages, with an auto dialing capability for up to 132 numbers. It can also broadcast to as many as 182 recipients simultaneously. The IntelliFax-4100e has an automatic document feeder, which can hold up to 30 pages, a feature that makes this fax machine capable for high volume copying duties, with a speed of 15 copies per minute, supporting multiple copying for a maximum of 99 pages with sorting capacity and 600 dpi for its copy output resolution. 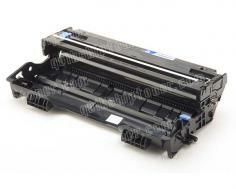 It also has reduction and enlargement capabilities, from 50-200%. The IntelliFax-4100e also has a built-in USB interface as it can also be a printer with a 250 paper tray capacity, with options for an upgrade to make it a total of 500, with the upgrade functioning as a lower paper tray. This feature allows letter paper type to be put on one tray and legal paper on another, which automatically chooses the correct paper type then prints incoming faxes. As for printing, the IntelliFax-4100e produces a respectable 15 pages per minute, comparable to middle-end printers in today's market. The IntelliFax-4100e design, albeit bulky by today's standards, is sturdy enough to carry 150 pages for its output paper capacity, and weight up to 43 lbs for the automatic document feeder and 28 lbs for the paper tray. For a pleasantly speedy fax machine, the IntelliFax-4100e consumes lesser power compared to other fax machine models that takes more time in sending fax messages. At less than 940 watts on its peak, even without the Energy Star qualification tag, the IntelliFax-4100e helps in saving costs while still providing a robust performance. The IntelliFax-4100e has dimensions of 17.4" x 17.1" x 12.7" for its width, depth and height, and comes in at 23.3 lbs, which is quite bulky for a small office set up. 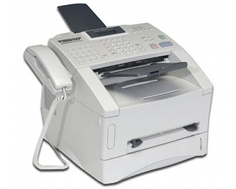 The fax is also not the quietest available today in the market, with up to 53db when handling copying tasks. The LCD display of the IntelliFax-4100e can also use an improvement, with only a maximum of 16 characters and dual line, a bit lacking considering the IntelliFax-4100e also functions as a printer. It can also be difficult to view the LCD display from different angles aside from the top view. One would need to place the IntelliFax-4100e on a low furniture just to see clearly the 2-liner display, which is unusual considering a business setting. With only a 600 x 600 dpi, the IntelliFax-4100e resolution is comparably lower to other models with similar features. With its shortcomings on features, the IntelliFax-4100e is considered expensive at around $300, as other fax machine models have very similar features at a lesser cost. 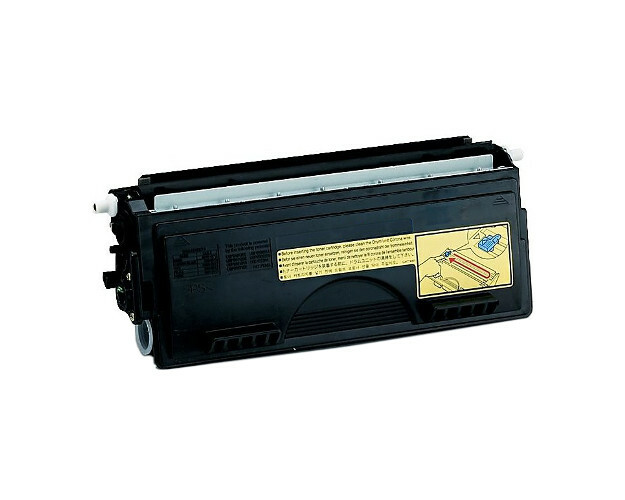 Review it: "Brother intelliFAX 4100E "
The IntelliFax-4100e ships with a standard yield toner cartridge capable of producing 3,000 pages of monochrome prints, while its drum unit has a 20,000-page yield before needing a replacement. The toner cartridge can be replaced with the high yield variety, giving an additional 3,000 pages. This should allow for lesser costs per page.The IntelliFax-4100e is built to last, with a monthly maximum duty cycle set at a durable 15,000 pages and 500 to 3,000 pages recommended for each month to prolong usage.